Find decorative vent covers, cast iron floor registers, plastic floor vents, and hard to find large and odd sized floor registers. Beautiful wood floor register covers in unfinished Red Oak, White Oak and hard-to-find Brazilian Cherry. A full size range and wood species in wood flush mount floor vents with affordable pricing. Please note: you want to order your floor vent by the size of the hole opening you are covering and not by the existing cover (faceplate) of the vent you currently have. Want to browse our floor vents by the size you need to purchase? Check out our NEW Browse Floor Vents By Size page. 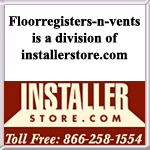 This allows you to view the exact styles of floor vents available in the size you need.